FROM cityscapes to architectural installations, Jello is in the thick of a culinary comeback. And now, you can have your Jello and drink it too. Sort of. Introducing Jelloware: a new line of disposal cups made of a seaweed extract called agar agar. The creation of design agency The Way We See The World, Jelloware ‘re-imagines the concept of drinking’ by imparting new tastes, smells, and textures to your typical glass. Each agar agar-made cup represents a different flavor from lemon-basil to rosemary-beet. There’s even Absolut Jelloware where different edible cups are flavored to match a corresponding vodka drink; think a dirty martini in a garlic olive cup, or a Bloody Mary poured into a pepper celery glass. Take a bite then a sip, and repeat as necessary. 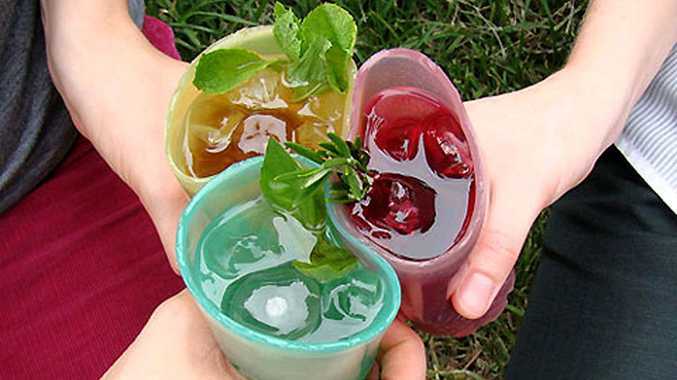 Once you’ve downed your wobbly drink, simply toss the Jelloware cup onto the grass where it’s said to help nurture plants to grow – a solid alternative to plastic cups indeed. Bill Cosby would be proud. For more funky food check out Lost at E Minor.